Web developments keep evolving with fresh trends which directly or indirectly compels the website owners to get updated to stay fit in the competition. Day by day, the competition keeps increasing as 200 new websites are launched every minute. Imagine having a place or holding a rank in the midst of over 200 million active websites. Shortly or fondly called as AI, artificial intelligence has become one of the most sought-after technology in the digital world. Considerable amount of companies is seeking to implement Artificial Intelligence to reap the results of digital transformation. AI has got its grip in web development also. AI industry keeps growing momentously and an estimation by Gartner shows that it will reach a giant leap of 70% by the end of this year. Therefore, more than 40% of the companies will deploy AI to improve customer satisfaction and efficiency. 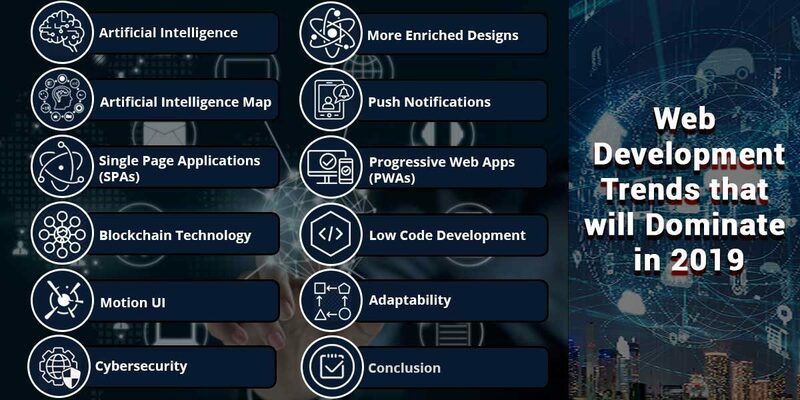 Undoubtedly, AI is emerging as a crucial trend in web development in this year. When the navigation gets easier, web users get attracted to it. That’s where SPA have caught its place. As far as the application is easy to navigate, it becomes more popular. Web users get attracted and interested more in the faster and simple design. SPA’s are fine on mobile and desktop and has become a notable trend this year with easy navigation and menus. Bitcoin and other types of cryptocurrencies has brought the blockchain technology as trending digital transfers. Uncompromising storage of data through distributed ledger is called a blockchain technology and it has become more popular these days in various industries. Huge amount of transactions can be authenticated easily by using blockchain technology, its emerging technologies and streamlined management of supply chains. Leading industries and technology giants are developing their blockchain technology platforms. The attraction factor in interactive graphics has made it increasingly popular these days. Web Development companies have started to understand the scenario that web users are interested in spending time in giving their attention to the motion graphics on the web pages. The static images and the graphics based on flash are not drawing much attention and people gradually lose interest in such UI. Therefore, it is time to start concentrating on Motion UI as it has become the preference of the web users. For many years, web designing companies have been emphasizing on functionality of the website and simplicity of the design because of the trend. Lately, there is a change in this idea as the rich graphic images and animation has become quite dominating. Enriched design is the trend in this year due to the growing demand. For example, most of the text contents are replaced by graphic contents as it seems to be quite easy for the users to understand. Obviously, the demand for enriched graphics increases. Like mobile apps, push notifications in websites is getting popular as it is easy to manage at both the ends. It quickly replaces the email newsletters. It is used for personalized promotions, and to notify the updates and special offers. This trend in 2019 will drive more business than before. Progressive web apps combine the benefits of websites, browsers and mobile applications. Businesses that have shifted to progressive web apps from usual websites have been reaping higher conversion rates and also customer engagement. PWA will be undoubtedly a trend in this year because of the combined benefits. Low code development is highly beneficial as it facilitates the development of wonderful websites without the need of coding expertise or experts. Rather than the conventional web development process, low code development is preferred these days by several web development companies. One of the most important factors to reach wider audience is to get the website displayed across various devices and gadgets. This paves the way for the companies to make their websites available on any device. More the adaptability, more the response is. Apparently, adaptability is a key trend in 2019. The unexpected data breaches, confidentiality breaches, data privacy and other cyber-attacks has been a major concern of many IT companies and its professional. Definitely, cybersecurity remains as a key trend in 2019. Apart from the trends listed above, other technologies like AR, IoT and Voice User Interface are also emerging this year and will be leading trends for sure. Request FREE Advise by filing up the form. Copyright © 2018 Kudosta Solutions LLP. All rights Reserved.